I’m with you Pattye. No billboard or demolish of the clockworks building which has been a mainstay for these years. Certainly not in character with the township’s historic character. Here’s a photo of the Clockworks building — thanks Christine Johnson! That intersection is dangerous as it is. A distraction of this type could be lethal. Similar signs on 202 are a great distance away from the flow of traffic, yet they also present a dangerous distraction. Additionally, signs of this type are greatly brighter than anything else in the surroundings giving off an unearthly glow at any time of day. Despite the landscaping and stone work, this installation will be an ogre in an otherwise quaint village. I was at the meeting. I personally do not like billboards, especially electronic billboards, and do not see this as an improvement to the corner or as an attractive ‘gateway to our community.’ It feels about like having a blaring TV screen in every restaurant, which I hate. I was surprised at the people who thought this was such a good thing. I was too startled to get up and speak my mind. Am I that far out of touch? Does a screen rolling non-stop ads really reflect our community? Do seasonal plantings of non-native plants really add to our appeal? Yeesh. I was not at the meeting but wholeheartedly agree with Mary’s comments. WHAT is our alternative? HOW do we need to act to STOP this plan? Has this already made it through the ‘Zoning commission’? Do we have to get a resolution on saving the clockworks building?? If they have to have digital, could it at least be the size of this existing billboard? What a shame. I completely agree with your assessment. Thanks for taking this on!~!! Welcome to Tredyffrin Township where we sell our souls to sell you crap. I cannot believe that anyone in their right mind would think that this is a good idea. Supervisors are you listening???? That intersection is already dangerous and now we are going to add a large digital billboard. Just what the redevelopment of Paoli needs, digital blight! UGH! Ban it! I rarely agree with you Pattye but do on this issue. The sign is not needed and not related to our community. No fan of the present building which appears to be out of place, but a billboard would not be an improvement. The key now is to mobilize and fight this tooth and nail! I agree the distraction level is already at an all time high with the phone tinkering going on! We do not need this and especially at the expense of the Clockworks building! Time to call your supervisors, historical society members, Rep. Kampf and all other township officials!! At the August BOS meeting which I attended, there was an abbreviated presentation by Catalyst. 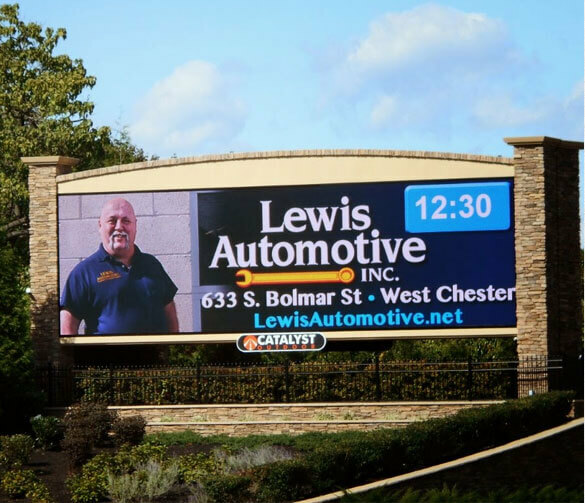 At that meeting there was a comment made by the solicitor about an agreement between the township and Catalyst regarding the digital billboards. Last night, township solicitor Vince Donahue stated that Catalyst believes that Tredyffrin Township’s ordinance regarding billboards is defective and illegal and that the company was prepared to commence litigation against the township over the matter. I know that in other municipalities, litigation has occurred over these digital billboards. It is my understanding that if a township allows billboards (Tredyffrin Township has three), then it is the view of Catalyst (and presumably other electronic sign companies) that is discriminatory not to permit digital signs. But if there some kind of agreement in Tredyffrin between Catalyst and the township, don’t the residents have a right to know what it is? There was no vote last night, just the presentation and the matter will be in front of the public again. But what I am not clear about is did the township sign an agreement and we are getting this digital sign??? And I know that for some you reading this post, you only care about banning the digital billboard — however, if Tredyffrin Township had a historic ordinance of protection, this would have prevented the demolishing the Clockworks building and therefore prevented the installation of the digital sign. I wrote an e-mail to the Board of Supervisors just now and plan to be in attendance at the next meeting on 10/22. Hopefully it’s not too late to provide input on this very important issue! Looking more long-term, I agree with you that the township needs a historic preservation ordinance. How does this get started? Are there model ordinances which can be adapted/reused from other townships? I am also with you ! The Gardeners of the National Garden committee are opposed as well. Someone is not wrapped to tight or does not have many leaves on the top of his head to even suggest this! I agree that a digital billboard is a distration for drivers on an already busy intersection. We don’t need it. We don’t want it. It detracts from our lovely community. How much $$ is the digital billboard projecting to bring in to the township? And what will that $$ be used for? Catalyst receives the advertising dollars from the digital billboard not the township. The township is given the opportunity to advertise on the billboard — events, notices, etc. w/o charge. There were certain intervals spelled out as to timing of the free township advertising. Again, it’s the sign company that receives the advertising dollars. It is amazing how quickly the NIMBY movement can be activated. It is a commercial corner, no history in 7-11 or Walgreens, but once those buildings get to be old enough, they too could be categorized as “Historic resources”. People are calling the clock works building a “treasure” and using it as a way to fight this billboard. Come on, it’s just an older building, in a place very difficult and arguably dangerous to access. I am not championing the billboard, but am not a fan of “slippery slope” arguments or trying to call something historic or dangerous to get your way. That intersection is made dangerous by some of the people reading this. Driving too fast, looking at your phones, thinking red means stop, green means go, and yellow means punch it, following the car in front of you though the intersection because you gotta get to practice or whatever and didn’t allow enough time. How many of you have been heading south in the right lane on 252 approaching 30 and ridden the bumper of the car in front of you to keep someone from merging in from the left lane? That’s the kind of stuff that makes that intersection dangerous. 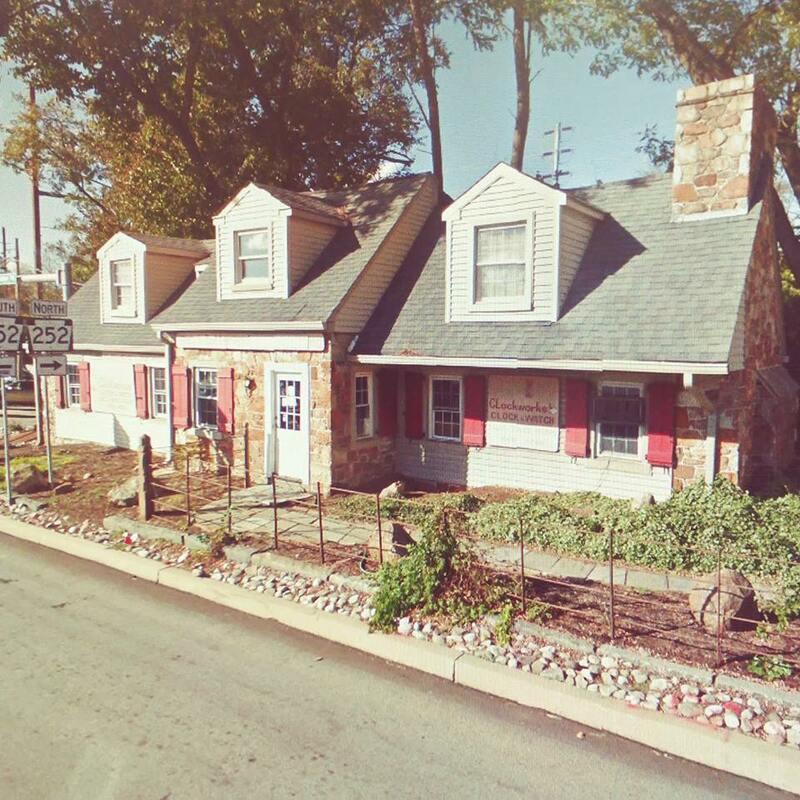 Take the 100 yr. old Okie house out of the quotient — is a 20 ft. digital billboard what you want as the “Welcome to Tredyffrin Township monument”? Having these ‘TVs in the sky’ along a freeway is one thing but locating this billboard at arguably one of the most congested intersections in the township is ridiculous! Not my idea of progress in Paoli’s redevelopment plan! This billboard would make this intersection even more dangerous! It is my understanding that there is no signed agreement between the digital billboard company and the township – yet! I object to the proposal for a digital billboard to be placed at the intersection of Rt 252 and Lancaster Ave., Paoli. This is already a dangerous, high density and complex traffic area. An electronic billboard would only further driver distraction. Additionally it is an energy drain and not in keeping with the tenor of the community. Can the digital company add sidewalks, crossing lights and a crossing path as well as video? Pedestrians do cross that intersection. I’m pro business but this monstrosity will ruin the tenor and culture of our quaint and historic community and turn it into “the Las Vegas effect.” What will be next if we start down this path——a casino at the next corner in a few years? This is exactly how a culture like that gets into a community like ours and ruins the pride and dignity so many before us thought long and hard to create and protect. We need to stop this now. Las Vegas effect? A casino? Seriously? We certainly wouldn’t want “them” in “our” community. Are you telling me that there are supervisors that are supporting this nonsense. A welcome monument, are you kidding me? Visual pollution of more and more advertising! Digital Billboards = Visual Pollution. Watching the presentation it certainly appears that several of these supervisors are supporting the Catalyst billboard project. But again I caution that an actually vote was not taken, so no signed contract yet. If you know a supervisor, now’s the time to contact him/her. Who actually owns this property? Did the township recently buy it or is it still privately owned? The size of this billboard would exceed sign ordinances. Depending on the zoning, it could be ruled out entirely. Of course they could go for a variance but this should be challenged and defeated. The township did not purchase the property, it was privately owned. Catalyst Outdoor Advertising purchased it this summer. Because there is an existing billboard sign on the property, that is where the rub becomes that Catalyst contends that they can replace it with a digital billboard. As I understand the argument, Catalyst views that it is discriminatory on the township’s part if they are not permitted to install a digital billboard. The township’s ordinance does not explicitly prohibit digital billboards. It is my understanding that the proposed digital billboard will not go to planning or zoning boards but rather directly back to the Board of Supervisors. And based on what I watched of Catalyst presentation at Monday’s supervisors meeting, it appears that (sadly) several of the supervisors think this “welcome to the township’ monument is a great idea. I stand corrected — there is a lease agreement between the owners of the Clockworks property and Catalyst. Catalyst did not purchase the property, they have a “leasehold mortgage” on the property. If our community accepts a 20 ft digital billboard anywhere, but especially at this location, it’s a clear sign that we are abandoning the standards, values and dignity that went into creating this place and allowing the bill board to display a lack of caring and thoughtful consideration for the tenor and life of the community in the years to come. Yes, and we should remember that there are two other billboards – one on Bear Hill Road (Rt. 252) and the other on Lancaster Ave (across from BMW dealership). Neither of those billboard locations are located at a busy intersection – such as what is proposed. However, I guess that’s the reason why Catalyst wants the Rt. 252/Rt. intersection for their first digital billboard! Ugh! The sign on Bear Hill appears to be in an R4 district which means it shouldn’t be there. It was given conditional use on parcel 43-10-11. The one on Lancaster was done by conditional use as well. Parcel 43-11E-80. Conditional use requires a zoning application and hearing and for the planning commission to look at it. This should be the minimum for Catalyst! These are the arguments to be made! Probably goes without saying, but this is all about revenue for Catalyst. The existing billboard at that location is contracted for a month at a time. The digital sign changes 8 times per minute. So it’s 8 advertisers per minute versus 1 per month. Huge revenue opportunity for Catalyst. You better believe they will invest all the resources necessary to bulldoze their way through the BOS and anyone else that stands in their way. The citizens of the area need to rally like never before to have any chance of prevailing. Could not agree more — major community push back over this matter is the only thing that may move the BOS to change their minds. I assume everyone else got the same response from the BOS that I got. Basically they are afraid of being sued. Although I agree that losing the Okie building would be a bad thing I believe to fight this properly we need to forgo that issue. There is enough in the sign code that can help stop this. 208-131A is the code that gives this parcel the conditional use right for the sign. But that code also says that if there is a conflict of codes then the most restrictive would prevail. The most restrictive is 208-1262A which is for the C1 district and only allows for 40sq ft.
To me the first question is what was the conditional use exemption given to the owner of 43-9M-160 and should that use transfer to a new owner? To me this is a valid argument. Lets not be too late. Let’s not be too late. Here is a huge government study done on visual behavior when it come to billboards – both standard and digital. Where was the study done – highways and arterial roads. They didn’t even study it on surface streets because placing a giant digital billboard on a surface street AT AN INTERSECTION is just silly. ……or we could call for a community wide boycott of all the businesses that choose to use the digital bill board as a means for advertising. Just want to add our names to those who OPPOSE this ugly, giant digital billboard. Let’s leave Las Vegas in Nevada. Our residents’safety is more important. Look to Radnor for maintaining some class. Totally agree. Keep fighting and thank you! As noted by another above, I do not fee strongly about the building. It seems out of place at the this tight, busy intersection which could use “less visual clutter.” A large digital sign would be a traffic nightmare. Such signs might be fine for highways where they can offset, but in a built up area that his much traffic they should not be allow, or severely restricted in size. Another consideration should be the visual or blinding effects on workers of SEPTA and the trains that pass next to the property. The township supervisors always want to squeeze every tax dollar it can all bits of land, not always to be benefit of those living here. This insanity has to be put to an end. This is what happens when we don’t get out the vote for township supervisors We need Tory Snyder on the Board, she lost by about 10 votes to long-past-his-welcome Paul Olson. We don’t need more distracted drivers at this crazy intersection. A lot of teens from Conestoga HS use this intersection. Tredyffrin provides us with virtually no services yet they constantly overdevelop our beautiful township (the new retirement complex is hideously large–who approved THAT?) We need new people in our township government! Several years ago. a woman I know was northbound at this intersection waiting to make a left hand turn. She was rear-ended by a distracted driver and has had life-altering tinnitus ever since. Even though this intersection is within our Township and beyond the concern that it would be an eyesore for our developing townscape, aren’t there any PENNDOT regulations that reflect the safety concerns about this type of sign at areas with our traffic density at a complex intersection?? No way it should happen. As everyone else says, “Too busy of a intersection”. That building should be saved and I have been in two accidents at the corner over many years. No need for more distractions.